Vichy print taffeta dress with hand finished flower appliqué, lined in white cotton with a concealed zip. A simple, sophisticated shape. The handmade flowers on the waistline add a playful and refined touch. 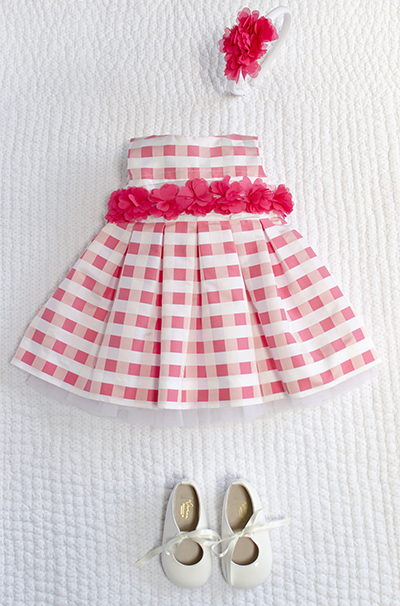 The dress is complemented by ‘Maria’ patent white shoes from Vevian and a matching flower hairband. Lavanda/aqua sleeveless taffeta dress. Ribbon and hand-finished crystal appliqué on the waistline and a puffy skirt. Concealed zip fastening. A romantic shape in soft, delicate hues. The pleats at the waistline and the laser cut patterns add a modern twist to a timeless piece. Perfect with ‘Emily’ light grey shoes from Vevian. Pink and white taffeta’ and velour fabric with matching diaper pants. Lined in pink, with two fabric ribbons on the shoulder, it is a sophisticated, romantic choice for a christening or special occasion. Narciso sleeveless dress in a fine, light fabric with three ruffles and a fabric bow on the shoulder. Lined in blue cotton, it features a clean concealed zip fastening at the back. A delicate fabric in an intense narcissus hue, this dress is an elegant and modern springtime choice. Ideally complemented by ‘Cree’ metallic purple shoes from Vevian. Flower pink ensemble in a very fine fabric with flower appliqué and matching diaper pants. Lined in white cotton. 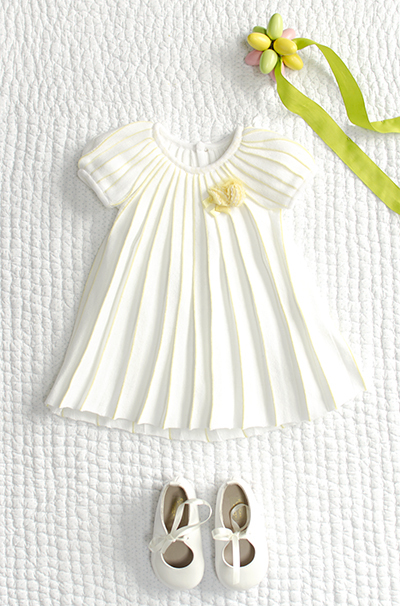 Light and flowing, this little outfit would be perfect for hot sunny days. Complemented by Maria white patent shoes from Vevian. White 100% cotton romper with crochet top and embroidered flowers. The lower part is made from fine cotton fabric with button or stud fastening. 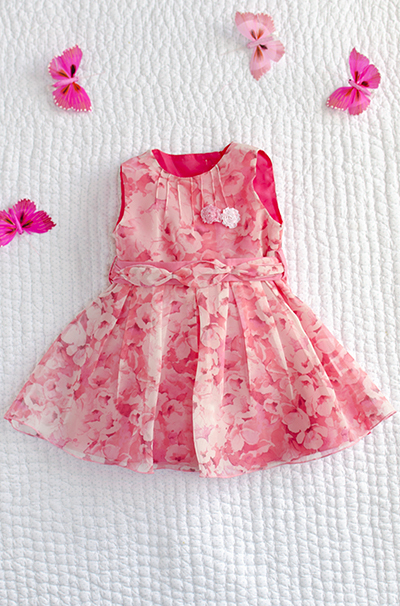 Delightful, light and romantic, it will be the perfect choice for the first spring outings. 100% cotton knitted bonnet in white with flowers embroidered. 100% cotton knitted reversible wrap blanket with matched white patterns and embroidered flowers. A knitted plissé cotton dress with flower appliqué and mother of pearl buttons at the back. Knitted in a fine, light cotton which is perfect for the summertime, the dress features a beautiful white plissé A-line for a crisp, fresh look. The hand finished flower appliqué and the yellow knitted borders add a playful touch of color. Shown with Maria patent shoes from Vevian. Sleeveless floral dress in a very fine fabric, with bow at the back and hand finished flower appliqué. Lined in pink cotton. Mother of pearl button fastening. A light, flowing cut in a delicate peach blossom pattern. The crafted lines at the collar and the two-tone belt contribute to create a sophisticated look. Pink and white knitted 100% fine cotton ensemble. 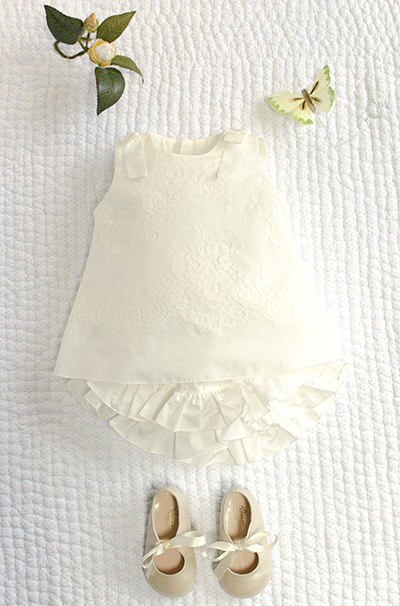 The top has a detachable Peter Pan collar in white cotton, flower embroidery and knitted ribbons on the sleeves. The bold contrast of white and petunia pink evokes the fresh, crisp look of manicured spring gardens. The white cotton collar and detailed embroidery add a romantic touch. Perfect with Maria patent shoes from Vevian. Antique white taffeta and lace ensemble. 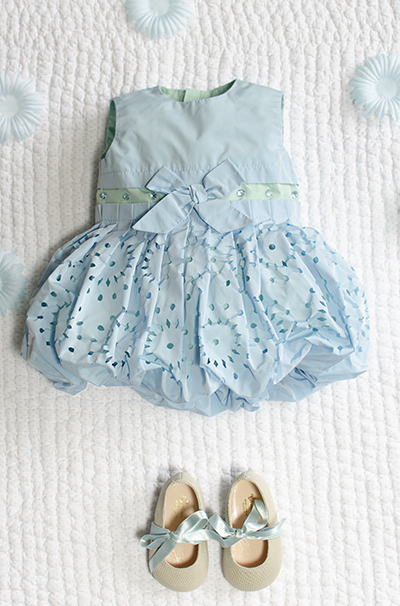 The top features two fabric ribbons on the shoulder and ruffled diaper pants. Beautifully complemented by Maria ivory patent shoes from Vevian. Cotton knitted cardigan with 3 buttons on the front and little raffle and cotton knitted cardigan in a bolero shape, with little crochet ruffle at the back. Available in light pink, red, aqua, mint, orange, cream, navy. 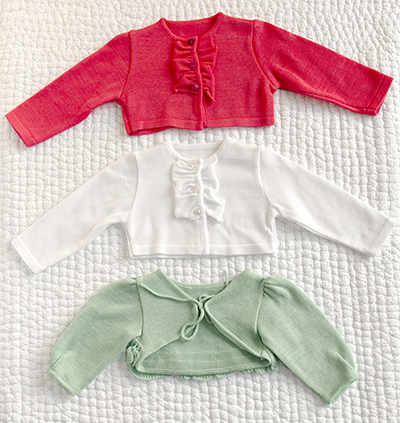 This practical yet stylish little cardigans, available in an array of colours, will enhance any little outfit. All babies and children clothes undergo allergy tests to guarantee high quality and comfort.